Sharon Kleve was born and raised in Washington and currently lives on the Olympic Peninsula with her husband. 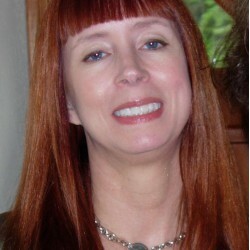 Sharon is a multi-published author of paranormal and contemporary romance. She loves romance. She loves reading romance, living romance, and especially loves writing about romance. She gets no greater feeling than watching her characters come alive in each other's arms. Most of all, she loves giving her characters the happily ever after they deserve—with a few bumps and bruises along the way. One of her favorite things to do is picking up a new book and sinking into the story, immersing herself in the emotions between the characters. She hopes to inspire her readers the same way her favorite authors have inspired her. When not writing, she can usually be found either curled up in her recliner with her cat and a good book, or in the kitchen baking sourdough bread or bagels. This book will open your heart to the Christmas spirit. Five Christmas stories from your favorite romance authors. After Joel splashes mud from his utility truck on a pretty woman who works at the mall, he wonders how he can ever make it up to her. Holli Segal can’t wait for her first big break to design the Christmas display window for Schroder Toys. But when a circuit breaker blows, she’s sunk. Will Joel be able to light up Holli’s Christmas in more ways than one? Skipper Bill and Elizabeth have been friends forever. But, when Elizabeth is offered a job interview across the country, these two friends are going to need the help of a little mistletoe to find their holiday romance. Holly Chamberlain can write love letters for others, but no decent young lady would dare write one for herself. So when her secret beloved, Grayson Clark, vicar at St. Martin in the Pines, arrives at her office with a request to write love letters for a shy friend, she suspects he is actually the friend and the letters are to the granddaughter of a baronet known to admire him. His request for her to replace an injured cast member of St. Martin's production of A Christmas Carol delights her, but the baronet's granddaughter is also in the cast, dashing any hopes Holly has for her own Christmas love story. Grayson Clark can speak eloquently from the pulpit, but not to Holly Chamberlain, the woman he secretly loves. After all, he's just a vicar while she is the daughter of one of London's wealthiest merchants and known to be admired by an up and coming barrister. Dictating his own love letters to her may be folly but what else can he do? Having her join the cast of A Christmas Carol seemed like a miracle, but now his predecessor is insisting Grayson be attentive to a baronet's granddaughter in order to pay for St. Martin's new roof. Can't vicars have their own happily-ever afters? After all, it's Christmas. Set against a backdrop of late Victorian London, and a production of Charles' Dickens beloved, A Christmas Carol, Christmas Stockings brings together two people who are only shy when they are together, and whose fondest wish is about to be granted-and they don't even have to use mistletoe! Corny Myers has a unique psychic ability; she can communicate with animals. In the pursuit of the perfect Christmas getaway in Victoria BC; Corny steals a tour bus; returns a flock of stolen Flamingos to their favorite lake; buys Steve, her tough-as-nails Seattle cop boyfriend, front row seats to the Cirque du Soleil; and she gets a bright and shiny new key.